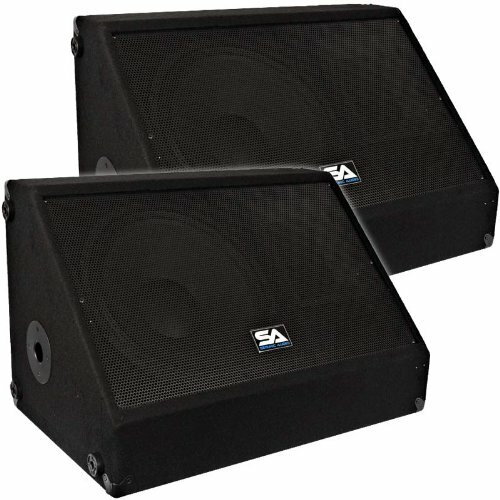 Pair of Premium 15" Floor PA Monitors - Model # - SA-15MX (Set of 2) , 2-way 15" pro audio speaker with 50 ounce magnet and 2.5" voice coil, 350 watts rms and 700 watts peak, 7x 9 Titanium horn tweeter, Two 1/4" and two Speakon inputs, Frequency Response: 45 to 20,000 HZ, 8 ohms, Sensitivity: 101 db., 2 inch rear port, 16 gauge full face steel grill, Large Pocket Metal Handles, Carpeted Black, Rubber Feet, Pole Mount, 28" long by 18" tall x 17" deep, Weight: 54 lbs per monitor, These monitors are brand new., One year warranty. This listing is for a pair of these monitors. You will receive two monitors, pictured and described above. Each monitor has the specs above. These monitors are great for vocals, PA systems, small DJ gigs, weddings, churches, and sound monitors. These can be used on any setup for full band or drum monitors. 2-way 15" pro audio speaker with 50 oz. magnet & 2.5" voice coil. 350 watts rms - 700 peak. Carpeted Black. Rubber Feet. Pole Mount. These monitors are new. One year warranty.